Impressive..particularly the mirror 2000 and the 1999 serf!! Two I wish I had !! Well, Snowball, just "bit the bullet" and purchased a 2000 mirror silver panda on eBay, graded ms69.....one more step in completing that series. Hope to have a set as nice and complete as yours some day. nice!! If there is anything I can help, drop me a message. I'm trying to ascertain the difference between the 1992 large date vs the small date. it looks the same as my graded small date. Could it be that from Snowball's pics that the difference is in the thickness of the font? Yes I would say a thinner font--but also a font that might be ever so slightly shorter. 03,04,05, are fast to spot(if coin is in sealing) becouse one has shanghai and other has shenzhen sealing. And also capsule is other. From Shenzehn mint you see 3dots inside capsule, by other there are no 3dots in. Difference: you can see that darker pur on back/shoulder of Panda is by one coin thicker at the end. For other years I did not take time yet to find difference like on 2003. Does anyone has some afther 2001 that can show differend minting in same year. For me, the font size look the same. But one of them has frosty date and frosty words. Even on the reverse, the panda and leaves are frosty. 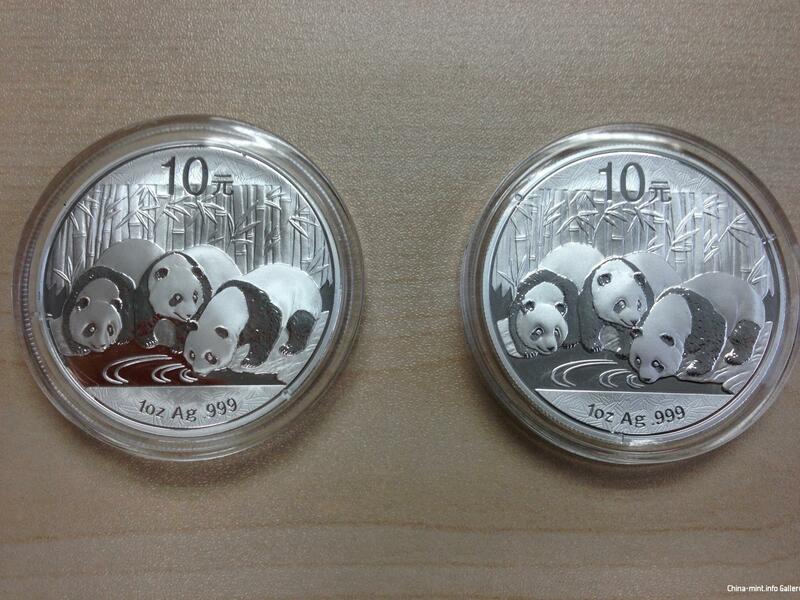 i wish china mint will produce frosted proof-like silver panda each year. how many varieties so far all in all since the beginning?. I was hoping to know whether the 1986 5 Yuan WWF Silver Panda have a BU and Proof version or just a proof version. All my Chinese source says there is no BU just proof....can anyone shed some light? here is written that oin was strucked in both quality, BU and PP. There appear to be two versions, BU and Proof. I'm trying to get my hands on a BU coin right now to confirm that. Peter, I found these 2 listing. They do look like BU quality to me. Also one with the COA claims that its a BU version. I was wondering if it is because the BU version was the "Exported" version while the Proof version is both exported and sold to domestic market? As all the Chinese dealers I have ask, they say they never heard of a BU version. I have both types in my collection. Colin has always listed both varieties on his web site and NGC has certified both types. Is is possible that there aren't two varieties but just two diffrent COA's? I suppose. I can upload photos tonight. I don't recall off hand if the varieties look different in hand. These certainly look like proof and BU versions to me. I have the COA's and boxes too but it will take a while to dig them up. yeap I agree. the proof panda is really frosty... if I am correct thats the one i got and should have a mirror back ground. Gonna try to find a reasonably priced BU version. SOme seller in ebay is charging me 60 USD for shipping... I nearly fainted. unusual thing is that the BU version is more rare than the proof. You don't see that often in the panda series. SOme seller in ebay is charging me 60 USD for shipping... I nearly fainted. $60 for shipping? That's insulting. The Postal Service charges $26 for sending a small box to Asia by registered mail. Please tell me what the size of date are for the attach 1992 and 1993 Panda. It's insane. But if the cost is clearly stated before the bid/buy, then backing out of the deal is a breach of contract. The 1993 that is posted here on the Forum is a Shanghai Large Date. The eBay item is a 1993 Shenyang Small Date. The 1992 that is posted here on the Forum is a Shanghai Large Date. THx peter. I just ain't good enough to tell the difference just by using pictures from Ebay.... Especially for 1992 and 1993 which IMO is impossible unless I get the both style on hand. By the way I am asking the seller since it fail to sell it, to sell it to me for USD 90, as I have also won the following 1996, 97 & 98 Large Date ( I got all small dates for these years), is USD 90 a good price if I get it? Are these 1993 a small date too? Thanks for the help. They are both out of their capsules and appear to have some flaws or damage. Both are Small Dates. Here photos of one of the raw coins I got today for 70USD each. Can anyone tell if this is the original packaging? and also.... according to prices at ebay the SD are more expensive than LD.... is this a correct indicator of relative rareness between the two varities?? I received from NGC/NCS a 1997 silver Panda S10Y coin as PF-67, it looks like the uncirculated 1997. Is this an error on grading as I have not ever seen a Panda Proof 1997? It is origial package, sealed by shenyang mint. SD. Are the variants of 2013 already known? Is this so normal or was the capsule changed here? Also around help with the assignment, please. Pic 1 = smal Eye? Is the coin on the left the same as the one in your bottom photo? Note that both of these coins came in capsules with 3 dots. This explains my question from above. The capsule is well then one fake capsule in the upper picture. What I see is a: The middle black band on the panda's backs do not meet like in picture 2 of Pandapaule's pictures and b: the eyes on the pandas are small and not large like picture 1. Hi, I am new to this forum and need help with a silver panda coin. Hope this post is in the right place. I have a 2002 1 oz silver panda coin that is sealed in a special China Gold Inc Packaging to mark the 20th anniversary of Panda Bullion Gold Coin. The pack is marked China Mobile, Guangdong Mobile Communication Co. Ltd. Guangzhou Branch. On the back of the pack it has all the details of the coin and that it was minded Shenzhen Guobao Mint. The pack is like a small book with the coin sealed in the center page has lots of info on the giant panda and its home plus details about panda coins. Can anyone help me out with any info about this issue of the 2002 1 oz silver panda coin. 1 picture is more than 1000 words. and show how to tell difference between frosted and mirrored branches? The tread below covers this topic. Page created in 0.462 seconds with 84 queries.